Animal goat is mentioned both as a symbol and as a vehicle of Gods in Hindu scriptures. In the Samkhya system of Hinduism, Prakriti is depicted as a female goat. Prakriti represents the Mother Nature. The color of goat is red, black or white and represents the three gunas – Sattva, Rajas, and Tamas. After the self-immolation of Sati, Shiva beheads Daksha and later, on repentance, Shiva breathes life into Daksha by replacing his head with that of a goat. Goat finds mention occasionally in Puranas and Vedas. It is mentioned that the seed which fell from Prajapati transformed into a male-goat. There are incidents in Puranas involving Indra and goat. Goat is also mentioned in Tantric texts both as an animal and as a symbol. Sadly, Goats are also sacrificed to Goddess Kali and other village deities. Thousands of goats are sacrificed during festivals in Nepal and in Eastern parts of India. This is something strange. 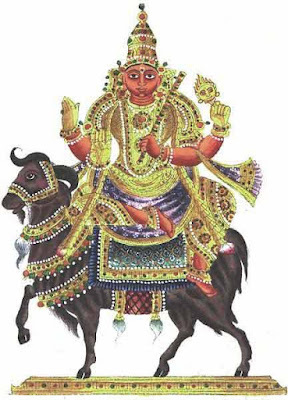 When goat is the vehicle of Goddess Kali, how can it be sacrificed? Animal right activists have been campaigning against such sacrifices. But the practice still continues in Kali temples in rural India. No god will be pleased with such sacrifices and Sanatana Dharma does not preach any form of animal sacrifice.